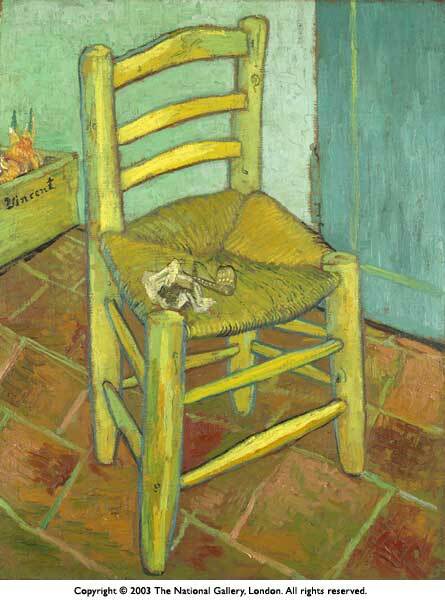 'Art is never finished, only abandoned'. As much as I would have liked to have taken such a good photograph of the Gallery, I found this one on a copyright free website and all of the remaining photographs on this post were courtesy of Wikapedia and similar sites. I was really disappointed when we were told that we were not allowed to take photographs inside the gallery. Never mind - we had such an amazing time! Just being in Trafalgar Square was nice. There is something to see in every direction; Nelsons Column, Big Ben, the Millennium Wheel... Oh and a few thousand students protesting about University fees along with an equal amount of police, TV Cameras, and helicopters! Still, it was all harmless and quite an intriguing sight! All part of the London experience! It was the first day of the Leonardo de Vinci exhibition at the gallery, but Mum and I have booked to see that one in January after the initial rush is over. Jolly glad I am too, since the queue ended up somewhere in China I think, lol! Inside the gallery, well what a treat! This one was SO much brighter and more vibrant in real life! We saw paintings by Constable, Botticelli, Rubens, Cezanne... The list goes on! And Mum and I learned that in the 17th cenury, people seemed to love running around with no clothes on! Whilst many of the paintings in the gallery weren't really our cup of tea, it was still amazing to see them. Many of the canvases were so huge that we couldn't possibly imagine that they had ever hung anywhere other than in castles and mansions! It was wonderful to see paintings such as the 'Sunflowers' just inches away and being able to see every single brush-stroke. It is those details which are lost on a screen or on print. What also surprised me was the sheer vibrancy of the paintings in real life when compared to what I have seen in books or on the internet. 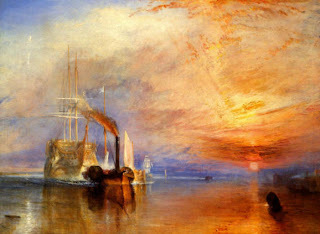 The best examples of this were 'The Fighting Temeraire' by Turner. 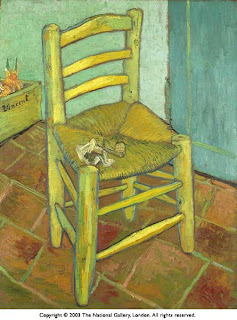 If there is one painting to see in real life if you ever get the chance, it has to be that one! 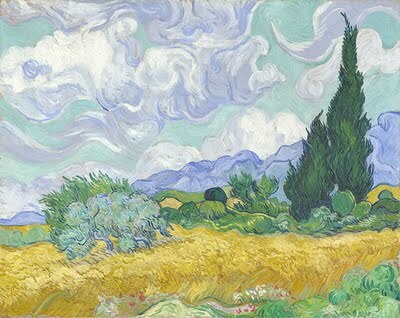 Also 'The Wheat Field', by Van Gogh. I have never seen a reproduction of that painting with any where near the brighness and vibrancy as the real thing. I was really surprised when I saw it! Anyway, I must stop waffling because I could go on and on! I hope to post my new bear soon, but meanwhile, I am HONOURED to have been featured on Crystal Cooks latest post! I couldn't believe it when she asked me! She is such an incredibly talented artists! I was so surprised to be asked and I had so much fun answering all of Crystals questions. I was equally as delighted when Crystal agreed that I could interview her on my blog too. So, watch this space because that (and of course the bear) is all coming soon! After Saturday at Earl's Court I was thinking I must do this again and go to the National - and here you are posting about it! Oh I wish I was there! Some years ago I saw the Van Gogh and Gauguin exhibition in Amsterdam, and I was surprised to see THREE sunflower paintings by Van Gogh. I never knew he painted several! Very funny to see three similar paintings next to each other, they were all slightly different. Thanks for the tour! Sandra, that quote by Leonardo de Vinci is SO true. Especially in my case, as most paintings are abandoned full stop! We also went down to London to see the National Gallery last month - it was wonderful. 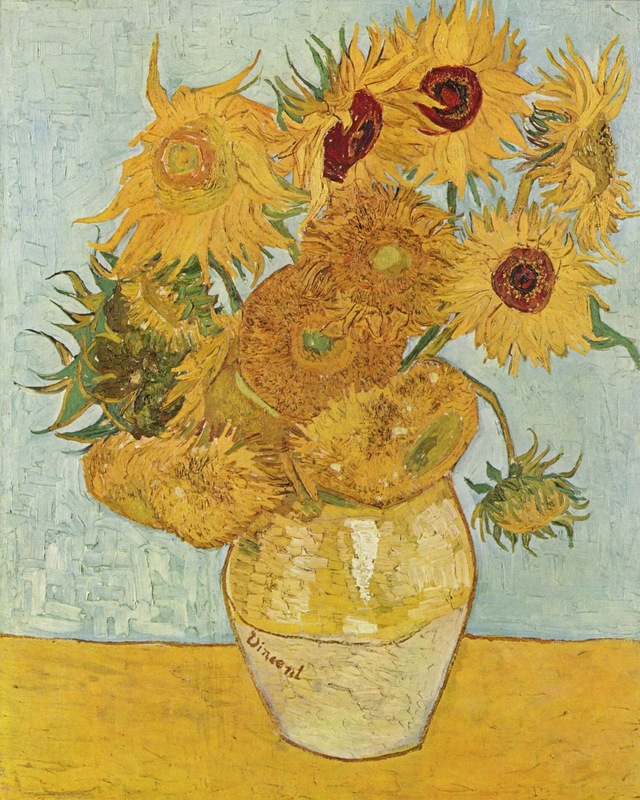 I never got to see those sun flowers by Van Gough, in fact I was so in awe of a lot of the paintings I came across, it was evident that more than one trip to this amazing place is called for. What an amazing experience! I can't even imagine how cool that would be to see those works up close. Well I take that back, I saw some paintings earlier this spring by Carl Bloch and I was literally moved to tears and stood in front of one of his paintings for probably fifteen minutes until my husband told me I had to move! It's so awe inspiring isn't it? To stand in front of a master's work that is so old. I love the Turner painting too. So vibrant. And thank you for that lovely shout out! I was honored to have you on my blog! :))) I'm waiting anxiously for the bear!! Looks like you had a wonderful time at the Gallery, Sandra. 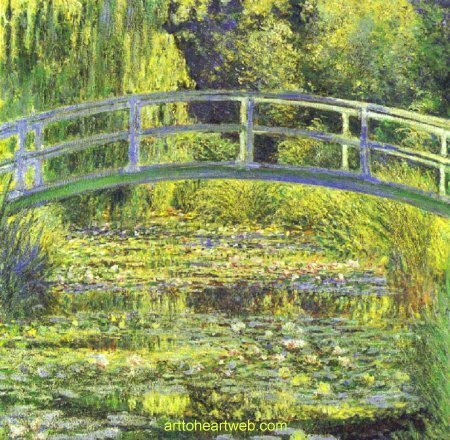 My favorite ..The Lily Pond by Monet. I also, look forward to your finished bear!! You LUCKY HEADLESS CHICKEN. LOL.. I am actually jealous of you right now. Van Gogh's work for real.. What a treat it muct have been..
Sandra, What an experience to be able to see up close the wonderful paintings by those artists! Great interview Sandra! I love your mouse sketch. Exquisite. I look forward to reading your interview with Crystal. Hi Sandra, you really had a good time having in front of you such amazing paintings! Un abbraccio! Glad you had a fabulous time. It sounds like a fabulous day out Sandra. It's about time I made the effort to get to the National Gallery. Barbra - Thank you! 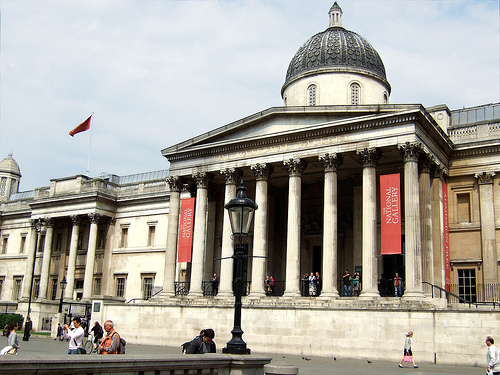 Well, Mum and I want to re-visit the Tate, so when we do, I promise to take lots of photo's!